As many people know, The Social Baby is all about understanding baby communication and baby-centred care. 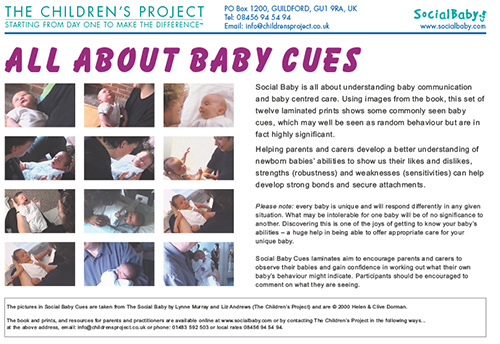 Using images from the book, this set of twelve laminated prints shows some commonly seen baby cues. These may often be thought of as random behaviour but are, in fact, highly organised and significant. The aim of All About Baby Cues is to help parents and carers develop a better understanding of newborn babies' abilities to show us their likes and dislikes, strengths (robustness) and weaknesses (sensitivities). This in turn can help develop strong bonds and secure attachments. Please note: every baby is unique and will respond differently in any given situation. What may be intolerable for one baby will be of no significance to another. One of the great misnomers put about by the media and some parenting 'experts' is that one hat fits all, and that babies behave and respond in common ways. Discovering this is not the case is just one of the joys of getting to know your baby's abilities - a huge help in being able to offer appropriate care for your unique baby. 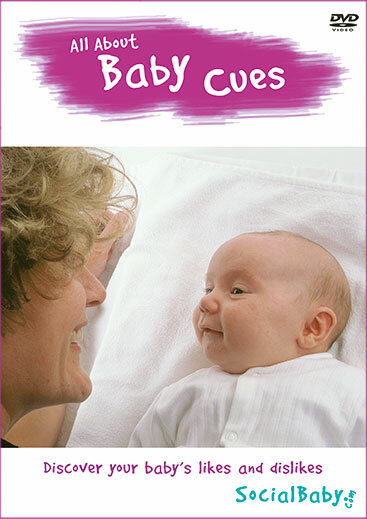 All About Baby Cues facilitators should encourage parents and carers to observe their babies and help them gain confidence in working out what their own baby's behaviour might indicate. Participants should be encouraged to comment on what they are seeing. "My baby doesn't like cuddles, does that mean she doesn't like me?" Note: Commentary on the pictures is written to be widely accessible.